On April 7, the highly anticipated 16th KNU Congress came to an end with the election of a new leadership to drive the organization for the next four years. Unlike many past congresses, the 16th KNU Congress attracted enormous interest from Burma watchers and from the Karen community around the world because many believed that the outcome would have a significant influence on the future of Burma’s peace process. Karen people worldwide were closely monitoring progress of the congress on social media daily and waiting anxiously to find out which faction would emerge as winners. On the frontline, it is known that Burmese military commanders in Karen State were analyzing every step of the Congress on a nightly basis. During one of the days, security guards at the Congress spotted a small reconnaissance drone, high in the sky above the meeting location, it is believed it belonged to the Burma Army. On first glance, the outcome of the congress appeared to bring little change and yet, the changes were highly significant. 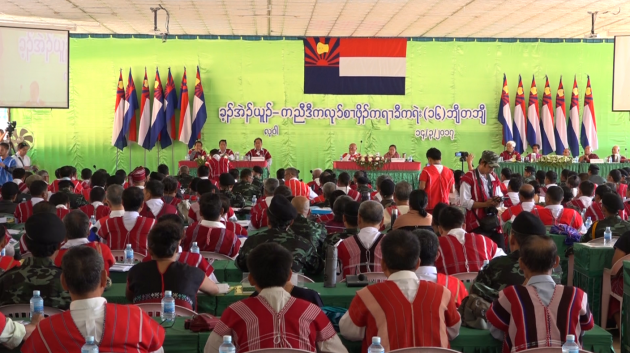 It brought little change as the “pragmatic and business-oriented” faction within the KNU retained power and positions. But the congress also brought significant change because individuals in the losing “idealist and policy-oriented” faction have now been pushed out of the leadership role and now lack decision-making power. Like some observers attending the congress, I was beyond surprised at the outcome of the election of this magnitude and scale. From the very beginning, I did not expect much change because I understand the reality on the ground. I knew beforehand, who controlled the most delegates and who would command the most votes in an election where delegates vote according to the “orders from above” instead of voting according to their conscience. But I was hoping somehow that a compromise could still be worked out so that all voices were represented in the new leadership. But I was wrong. The election was certainly free, there’s no evidence that voting fraud occurred. But a free election makes little sense in an outcome that may have already been determined and decided long before it took place. What is next in the peace process? Given that the new KNU leadership consists of only the pro-business and ‘government friendly’ faction, you can expect that there will be little policy change in regard to the peace process. Negotiations with the government will speed up because the new KNU leadership will face little resistance from the organizations decision-making body. For the Burma government, the new KNU leadership is a boost to its peace process, as it will be now more ‘open and receptive’ to the government’s agenda. But winning the election in no way gives the new KNU leadership a free hand to conduct negotiations with the government without taking into consideration local community concerns. Everyone understands that the ‘idealist’s faction’ may be down, but they are certainly not out. If they are pushed to the side too far, they could easily revolt, strike back, and derail the peace process all together. Despite losing power, the ‘idealists’ still command great respect and sizable followers in the Karen community, both inside and outside of Burma. As a result, any excessive attempt to sideline them could lead to serious backlash and easily break up what remains of the KNU. At this point, it is clear that the so called “pragmatist and business-friendly” faction misunderstands and underestimates the extent of public displeasure in the way they have dealt with the peace process. During my two weeks stay at the congress, I spoke with seven senior and mid-level military officers in the Karen National Liberation Army to try to understand their opinions and positions on the current peace process. Out the seven, only one expressed optimism for the future, while the rest are displeased and distrustful of the way their leaders have handled the peace process and negotiations with the Burma government. With this in mind, you certainly get an understanding that the foundation of the peace process remains very fragile inside the KNU. There is also a different interpretation of the meaning of the NCA and its association with the country’s flawed 2008 Constitution. For example, some leaders in the government-friendly faction argue that the KNU is not bounded by the military-crafted constitution despite signing the NCA. But others argue that by signing the NCA, the KNU is legally bounded by the constitution. In one instance, a district officer complained that he government has sent a letter to inform him that all village heads in his district will be appointed by the government in the future as part of the agreement in the NCA. This causes a lot of concerns for Karen community leaders as they are bracing for more government administrative encroachment in Karen communities, traditionally considered KNU territories. As a result, they advised and demanded that the Karen leaders to be cautious with in their negotiations, and not to rush the peace process without fully understanding the implication of agreements made with the government. If public opinion is any indication, the outcome of the 16th Congress does not look very promising for the future of Karen unity. Despite talks of gender equality and women’s participation in the Karen struggle, not a single woman has been elected to any top position in the new leadership. Instead, the only woman ever to make it to a leadership position, in KNU recent history, has been completely eliminated from all positions. Given that different opinions, voices and gender equality are no longer represented in the new leadership, there is now a deep divide in the Karen community between supporters of the different factions in the KNU. Followers of the ‘idealist group’, both inside and outside the country, believe that the election was rigged and unfairly carried out by the ‘pro-government faction’ to make sure the elimination of anyone seen as possible obstacle to their vision of the peace process. 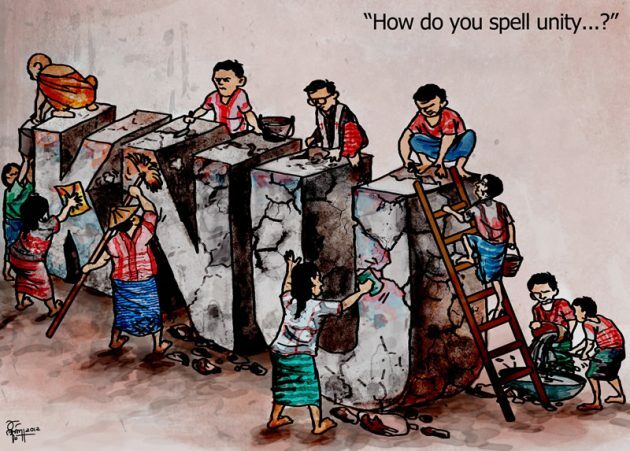 After the election, many Karen, particularly from the diaspora Karen communities, have begun campaigning to boycott the new leadership, by asking their communities to withhold any future financial support to the KNU. Representatives of the overseas Karen communities are upset and angry at the fact that they were denied the rights to vote and were treated as outsiders, traitors and spoilers by some KNU leaders for their critical views on the peace process. To protest and make their displeasure known, some representatives have called on their communities and declared that they no longer need to support the KNU. Others simply declared that the new leadership are not their leader. The onus is now on the new KNU leadership to try to bridge the divide and heal the polarization in the Karen community. To earn their trust, the new leaders needs to reach out to the different communities and groups, domestic and overseas, who are displeased with their policy. If they really care about the success of the peace process, the new leadership should also pay attention to the opinions and concerns of their critics, particularly those within their ranks and from the ‘idealist group’. This means that they will need to consult with opposing views and invite them to participate in the peace process. But if the election outcome is any indication, things don’t look optimistic that the new leadership will reach out to their critics and communities critical of their policies. In their quest for peace and cooperation with the government, it looks like Karen unity is no longer a priority for the new leadership. Some district leaders who support the peace process argue that “Anyone who thinks the peace process is wrong or is too fast to follow should step aside and rest.” Some of them see critics and skeptics of the peace process as traitors or enemies. The fact that all the individuals who possess different views have been eliminated from power is an indication that cooperation and compromise is unlikely. In their pursuit of peace and cooperation with the Burma government, some KNU leaders are willing to burn all its bridges. Beside unity in the Karen community, unity among the Karen armed groups will be affected by the outcome of the election. Under the new KNU leadership, given that its energy and priorities will be now channeled towards the peace process, efforts to reunify the different Karen armed groups will become of secondary importance. In the past four years, the KNU devoted so much energy and effort towards the peace process, but neglected to deal with the splintered Karen armed groups. As a result, after four years, unity and reunification between the Karen armed groups remains as elusive as ever. With this in mind, it is important to ask ourselves: can the Karen have peace without having unity? Or is peace without unity worth it?